An observation about the communications between Ancestry.com and FTM2017. I have been using the Web Merge feature of Family Tree Maker for years. It has worked very well. The biggest reason is that I don't have to re-type, then proof read the information from the record on Ancestry. As I have blogged about before, this feature puts a link in the Citation, right back to that record. I don't have to go looking for it. I further use the Web Merge feature for all websites, using the Web Clipper feature, then Web Merge. Because I don't have to re-type and proof read what is in the record, I have more time to really look at the record and see what the Record claims, and make sure that is recorded in my FTM2017 file. I record exactly what the record claims, right, wrong or indifferent, so I have a "messy" database, that is Facts for a person. Then I can Evaluate the information on a specific person's list of Facts and determine which is my current conclusion, or as I call it, "Current Thinking". It's important to know that all records have errors in them, but it's up to me to evaluate what I have. I was working with a 1900 U.S. Federal Census Record where my grandfather was who I was looking for. I found him, as expected, when and where he should have been. Yes, I knew that from the past, but I wanted to see what the new interface to Ancestry was doing in FTM2017. As I understand the process, when I follow a Hint, from FTM2017, I am taken to the Web Search Workspace, look at the Hints provided there, and select one of them. 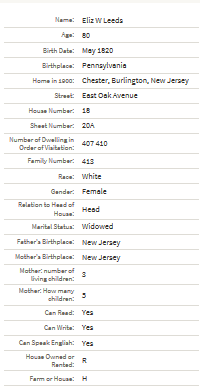 In this case, the 1900 US Federal Census for a township in New Jersey. When I select that record, I have the information from my database on the Lower Left field and the information from the Record in the Lower Right field. I then compare them to make sure that the record is for my person. 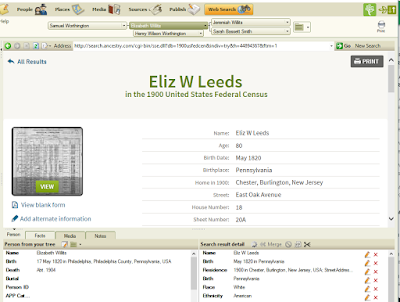 Elizabeth Willits is the person in my database. She married twice, once to a Worthington, and then a Leeds. I know that and that is why the Record would be for Eliz W Leeds. It's my evaluation of the same person. 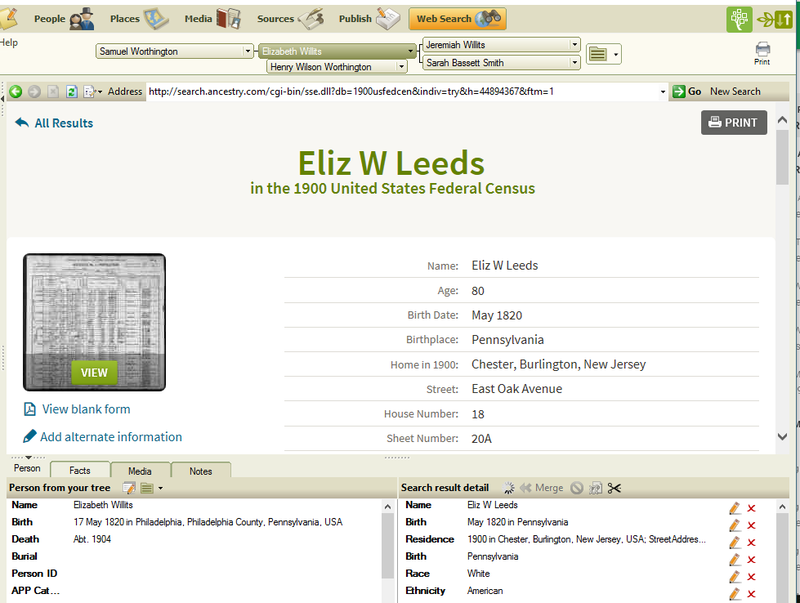 I will record her name, per the record as Eliz W Leeds, as an Alternate Name and the Web Merge feature will do that for me and it will include a Citation on that Fact. I won't go into all of the Facts in this record, because it has worked very well in the past. I did the Web Merge and as usual did my normal clean up. That is putting the Source into the appropriate Source Template, then reviewing all of the claims from that record and making sure that the Facts are entered correctly, and cited. I also add to my research log. In the above screen, I know you may not be able to read it, but below is the lower right corner, or the information from Ancestry. You may note "Ethnicity: American" in that record. Hmm. That information is NOT a field in the Census Record. There is NO Ethnicity field on that record. This website has more information about this specific Census Record. http://www.ancestry.com/wiki/index.php?title=1900_U.S._Census. The Record didn't have that question, why is Ancestry presenting this to us. It has NOT been there in the past, as I have done this many times in the past, for this specific census year. This is not the first "problem" that I saw, but it should have been the first problem that I saw, because there hasn't been an issue here in the past. In the Abstract for this Census Record, which I look at before I do the merge, that "Fact" is not presented in that abstract. When I looked at the abstract, I didn't see it coming in the Web Merge. So after the Web Merge, I saw that Fact in my database and went back to the abstract (above) and that fact isn't there. Looking at the image, that information isn't in the Record. Have you looked at an Ancestry Census record recently, especially the abstract? I ask that question because of what I found later. The family, was a Grandmother, her Daughter, two Grandson's, and a Granddaughter in the household. The Grandchildren were siblings from one of her Son's. The Daughter in question, never married, nor did she have any children. I was OK, until I god down to the "Mother's Name" for one of the Grandsons. Wow, that's cool, a Census Record providing the Name of the Mother ?? 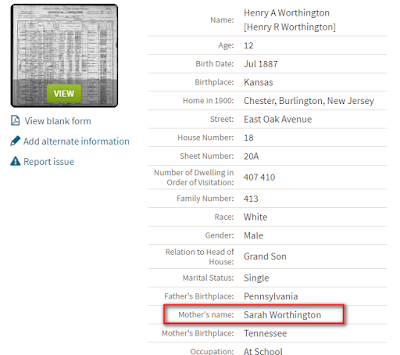 Not in any census record that I have looked at, has the NAME of the mother been on that record. But, that abstract from Ancestry clearly has a name in a field that does NOT exist in the Census Record. When did you ever see the Mother's name on a Census Record ? One of the features of the 1900 Census is the number of Children a female had and how many were still living. Eliz W Leeds had 5 children, 3 still living, which was correct, and Sarah was single, and therefore no information in those two columns. BUT Ancestry has abstracted the children below (three of them) as being Sarah's children. 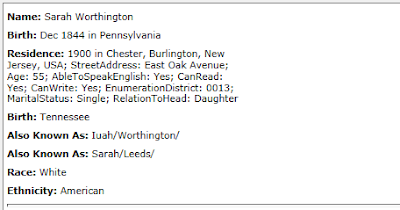 As it turns out, that is the Daughter of the Head of Household, Sarah, but the mother of the children (grandchildren of the Head of Household) was a Sarah C(K)atherine Reeve Worthington. The problem there is that she had died 6 years earlier. The father had died 3 years earlier, which is why the grandchildren were living with Elizabeth Willits Worthington Leeds in 1900. 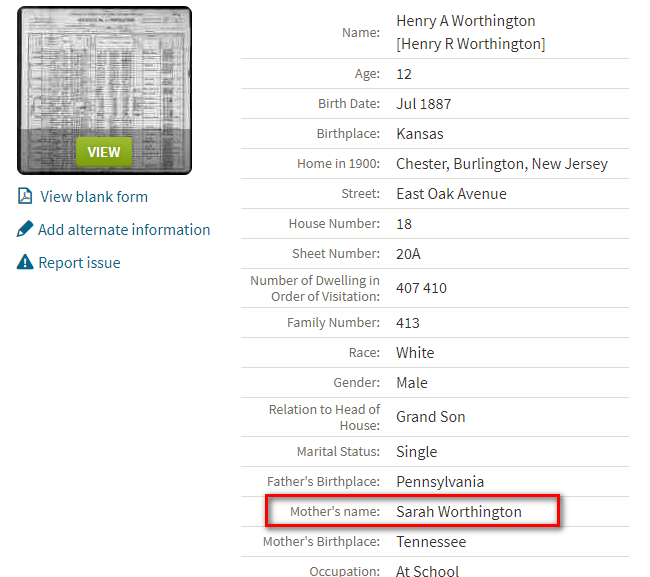 The NAME on the Census was Sarah Worthington. Someone assumed is should have been Sarah Leeds, or Iuah Worthington. There was not error on the Census, only the users edit. I that past, those User Edits were NOT presented in the Web Merge Feature. Look again. They were presented as "Also Known As" in the Web Merge. I don't want the "user edits" my database. I want what the record claims. I'll do the evaluation. Sarah Worthington is the correct name, in my database as well as the 1900 Census. This is not the first time that I have seen information in the Web Merge being brought into the database that wasn't in the record, but had not realized the scope of the problem. That is, how much information is being merged that really should not have been merged. Stepping back and doing some analysis is where I determined that Ancestry is putting information into their abstract that is not even in the record. Some / many will say "that is why I don't use the Web Merge feature". I am sorry, I make to many typo's to want to key in the data. I want EXACTLY what the record claims. I'll do the evaluation. Also, this had not been happening before the new Ancestry API to FTM2017. I have confirmed that this is not unique to Family Tree Maker. I have reported this as a Bug to Family Tree Maker, but I think some of this is issues from Ancestry on the new API that has been developed. Other genealogy database management programs may have similar issues. Note, I an NOT talking about Citations. That is a different topic. Some major clean up of the Labels going on at the moment to make browsing the Blog Posts for what you might be looking for. Remember the Blog Subject Lines are sort listing is by the Family Tree Maker Version number followed by the Workspace. For the most part, both the PC and the Mac version of FTM2014, FTM2014.1, and FTM2017 work the same. There are a few Mac Version (FTM-3 and FTM2017) mouse clicks that may be different, but I try to hi-lite them in the blog post.